This year will be the second year attempting to do it. I believe the last time I tried was 2009? And I finished. And it was horrible. A horrible bunch of fillery crapola that I'm scared to even look at. WELL! Not this year (hopefully) Because this year I plan to plan. Yes. Plan to plan. Sarah J Mass and Susan Dennard , who are posting writing advice during Nano. And Marissa Meyer, who will be sending out pep talks during the month. AAAAAND a few awesome YA author's have made a forum to help out! So you can "Ask a Publish YA Author!" 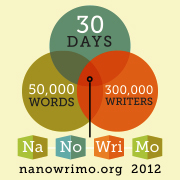 Now that I know I'm not a pantser, it's time to test my planner adilities and see if I can rock Nanowrimo 2012! I sooo wanted to do it this year but work got in the way. I am still writing just not for the deadline. Goodluck!